Great night! A great way to see the aquarium while dancing with your friends. Free glass of bubbly when you arrive, with friendly staff. The only downside is that it gets very hot in the main area so bring a hair band and dress accordingly, There is a cloakroom which they charge £1. Will definitely be going there again. The best way to visit the aquarium! Arrive early to wander the exhibits with a glass of prosecco (provided upon arrival) and see the amazing sea life in the dark, under neon lights. Then make your way to the dance floor, and feel as though you're swimming with the fishes. Drinks are reasonably priced and with a choice of 3 DJ's you'll always love the music. The evening ends at 11:45pm, even jellyfish need their beauty sleep, you won't want to leave. A fantastic experience, I can't wait to go again! This was one of the most fun I had in London in such a long time. I went there expecting nothing and it felt really magical dancing to the tunes with big or small sea creatures swimming around you in the dark, jellyfish shining in the neon light. I would never think of going to the aquarium during the day when it is filled with tourists; but for this occasion it was the perfect setting. My only issue was the sound quality time to time, there was some noise in some parts of the aquarium. I enjoyed music channel choices as well. I loved the venue - the little fishes swimming gracefully everywhere around you, glass floors and ceilings making you panic that there is but a fragile piece of material between you and the sharp-toothed sharks, the access to the jellyfish exhibition from where you could still enjoy the music... The only bit I wasn't so keen on was the lack of ventilation & air-conditioning: it was almost as if I was under water myself! Even though the Aquarium option is cheaper than the one at the Shard for example, it closes a lot earlier too - at 23:45 (whereas the Shard is open until 2 AM). I guess the fishies need their beauty sleep! Fancy partying under the sea! So grab a pair of glowing headphones for a fun night at The SeaLife Aquarium. I've been to several silent discos in London and it's always a great experience. The Silent Disco at The SeaLife Aquarium is one of the quirkiest one. The venue is magical. Definitely recommand as you can explore the main aquarium, wander around the jellyfish gallery while listenning great music from three different DJ sets. I've been to a few of these Silent Discos now and I can say that Silent Disco at SEALife Aquarium is definitely one of the best one here in London. The whole Aquarium isn't open but you'll still get to see the hypnotic passageway of jellyfishes and the main aquarium where the sharks and other marine animals live. The knowledgeable aquarium staff are on hand to have a friendly chat and tell you all you need to know about the Aquarium and the marine animals that call the aquarium home. Did you know the two sharks there have been with the aquarium right from the beginning almost 30 years ago? My only gripe is that because there's a huge amount of floor space to explore, the signal from DJ to headphones can drop the further away you find yourself from the DJ's. It's a tad gutting but that's something to be expected. Anyway, there are no such issues when you're strutting yourself on the dance floor. Definitely, one of the best venues to have a silent disco. If you're looking to go, make sure it's at the aquarium. Oh, did I mention you're given complimentary prosecco on your arrival? I had never been to a silent disco before, but this was such an epic night out I didn't want it to end! Walking on top of the shark tank at the entrance was awesome, and being able to explore the aquarium and listen to the music at the same time was an excellent touch. Had I known what a great night it was going to be I would have got there so much earlier to make the most of it! The DJ's were all fantastic and I felt spoilt for musical choices. This silent disco location isn't as frequent as the others so I would recommend getting tickets ASAP and checking it out! I would 100% return to this one again. Are you looking for something other than pubs or pop-ups to spend your London evening? Perhaps a unique thing to do on a date? Or do you simply want to find out what mischief the sharks get up to when the sun goes down? If you got a yes to any of the above, then you definitely wouldn't want to miss out on Silent Disco at the SEA LIFE Aquarium! Having been to the aquarium so many times, this was quite a different experience - the pictures really speak for themselves. Running from 7.45pm till 11pm, you have plenty of time to get ready after work and slowly make your way to the magical night. The doors are pretty much open most of the night for you to turn up whenever, however I do suggest turning up before the jelly fish tanks close at 10, it's quite a sight! With each ticket you'll receive a complimentary fizz. There's also bars where you can buy more alcohol on top of that. Just like any silent disco, you get a headphone at the entrance, and in this case you get a selection of 3 channels by 3 different live DJs. So do not be alarmed when you see others dancing and singing along to wildly different music to you - they are just listening to other DJs (and/or are having a very merry time!) Other than the dance floor, there are also other levels and exhibits opened, where you get a quieter experience with the fishies. Quietly sitting with the sharks enjoying a glass of wine, completely submerged in the peaceful ambience. It's like something straight out of a fairy tale. I would highly recommend it to anyone looking for an unforgettable night! Thank you SEA LIFE and the lovely staff for the breathtaking experience! Silent discos are becoming more and more popular. It such a brilliant idea to dance to music played through your personal headphones rather than speakers. The fact that dancers can choose between three different channels, means more classical music can share the same floor as ravers partying to hard-core techno music. The headphones are lighting up in different colour so you can also choose if you want to dance to similar taste public. Because they are now everywhere, it’s not just enough to have just ‘silent disco’, not it’s a competition of special venues. Shard is among popular ones and after visiting one in the Aquarium, I can say that the setting is excellent. It’s very charming to observe colourful fish, sharks, jelly-fish while dancing away. Small negative observation – as you move between halls, the music is fuzzy so you have to decide whether you want to walk around or stay where you can catch a good quality sound. The main area was downstairs, where DJs are competing between pop, r'n'b, soul and indie. The choice of drinks are great and the best option is to pay for an unlimited upfront. The best way to see the aquarium! Buy a ticket, grab a pair of headphones, tune into your favourite music and shimmy and shake it off with the Sharks. Incredible atmosphere and the jellyfish exhibit was great. It is an amazing experience! I'd never been to the London Aquarium before. This was the best way to see it! If you move too far into the Aquarium you loose the sound but it's nice for a break. Absolutely recommend! I'd never visited London aquarium before so a silent disco in an aquarium really appealed. You pop in a lift downstairs and greeted by friendly staff and directed towards the tanks. A firm immediate favourite was the large turtle literally just chilling on the glass tank wall. You could see sharks, stingrays and an array of fish. As we walked around we learnt more on the fish and the history and then we stumbled across the jellyfish section. I was fascinated by these little creatures and the lighting really helped you see every element of them. You have a great variety of jellyfish to see here and I would go back again to see them! Now to the silent disco, a great space downstairs not too far from the main fishes are 3 djs lined up and competing your listen to their track. 3 different stations from pop, r'n'b, soul and indie, I heard every genre possible. The bars were plenty and easy to spot and the staff very attentive to ensure any spillages and quickly mopped up. The event was very busy but plenty of space to move and dance. Just be warned if you take your ear phones off you will be hit by a delightful sound of hundreds of people singing different songs completely out of tune. Grab your friends and go along to a rather unique setting for a party and boogie! Going to a silent disco is always a lot of fun, add in a setting amongst fishes, turtles and sharks makes it even more of an experience. There are 3 different DJs you can tune into, so something for all musical tastes. Don’t miss seeing the jellyfish section upstairs as it closes early (such a cool exhibit), and visit the underwater tunnel (great for Instagram shots!). The only downside is that the drinks are a bit expensive and it’s cash only for the bar. Overall - a really fun night out. This event was fantastic, I got to enjoy 3 different DJs music selections through my headphone. I also got to dance and see sharks and sting rays swimming around at the same time. Not all areas were accessible but it was sufficient to give a taste of dancing among the sea creatures. The jellyfish section was cool - the lighting in the corridor and aquarium made the jellyfish look extra beautiful and amazing as they swim around. They looked like transparent umbrellas changing colors as they swim. Overall, it was a fun night, the crowd was young (20-30s average), the music was good and the atmosphere was unique. The Silent Disco at the SEA LIFE London Aquarium is the bomb diggy. Personally, it was the best silent disco I've been to. (I've been too many) The DJ’s kept us pumping all night long. The concept is great - dancing with the fishes, drink in hand and singing out loud to your heart's content. I would recommend everyone to go and try it! Had a ridiculously fun night at this event! Get the £20 wristband, it's well worth it and the beer/wine is actually decent. Dancing with the fishes around you is super surreal, but the DJs are extremely good and the tunes keep coming out all night long. You don't get to see all the exhibits, but you get the main pieces and with a bunch of mates, this is an incredible night out! Incredible experience at the Silent Disco of Sea Life! Enter through a glass tunnel/aquarium before reaching the dancefloor and dancing like crazy on a great playlist. The concept is unexpected and the place perfect for it. You only get to see a few aquariums and not the entire Sea Life but a really great experience to try with friends! Love a silent disco & this has to be one of the best venues yet!! Hypnotic jelly fish & mesmerising sharks & rays. I did the drinks included wristband which was brilliant value & handy at the bar. My only wish is that one of the DJ's could be suitably cheesy & play a Little Mermaid mega mix- Under The Sea would have been positively life affirming!! What an experience! I'm not usually a big fan of silent disco, mainly because my friends absolutely love it and are constantly dragging me along, I've basically got a bit bored. However, Silent Disco surrounded by Sharks, Fish and Jelly Fish was just on another level of epicness, and my Instagram was on FIRE.The music which has to get a mention was also on fire, with the DJs doing a sound job of keeping everyone entertained. On arrival, I was presented with a glass of prosecco but there was an amazing deal of £20 per person for unlimited beer and wine, despite not taking up this offer myself it is such a good deal if you plan on drinking the night away. Usually, when I've been drinking and see a shark coming towards me at head-height, I usually know I've had one shandies too many. In this case however, it is fine as they are one of the star attractions at the silent disco at the SEALIFE London Aquarium. The setting is superb (especially when you are in the 180 degree observation tunnel), a nice of choice of soundtracks (Disney's Little Mermaid anyone?) and also a main dance-floor (although I preferred exploring the darker recesses). The main downside was the lack of choice of drinks and poor quality of the wine. Although I didn't personally find it enjoyable as the Silent Disco at the Shard (that outdoor open area takes some beating), I'd totally recommend this to Londoners and tourists alike. I never knew I wanted to drink, dance and look at sharks all at the same time until I went to a Silent Disco at the Aquarium. Having never been ( shameful, I know) to the Sea Life London Aquarium so did not expect it to be as big as it was, honestly, how does this all fit in central London! With 3 well spaced out bars, 3 channels with a variety of music and lots of space to explore, it was a great evening and I'm sure a lot of sore heads the next day. This would be a great event with a group of friends who are bored of the normal nightclub experience. No one needs to dress up or impress anyone here as you can stick on your headphones and dance like it's only the sharks watching. 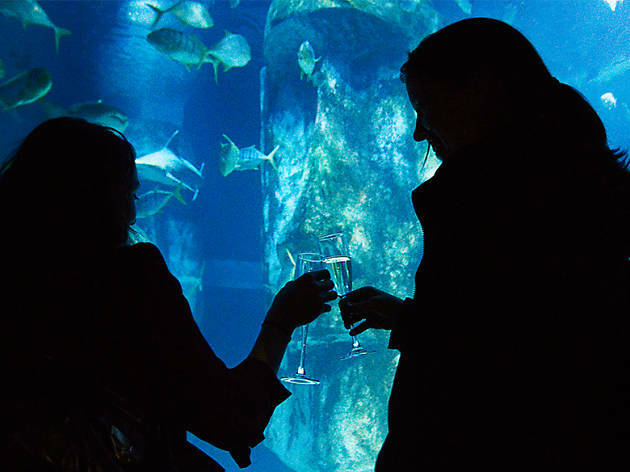 It was an amazing night and for any adult who hasn't seen the Aquarium, this is definitely a great way to experience it, especially with a £20 unlimited drinks wristband! If you want to try something different, then go to Silent Disco! The concept of having a silent disco is fun, but having it under the sea is amazing. SEA life near Westminister, is a cool place to see, different animals under water, and top it up with wearing some headphones, where you can listen to three different channels of music that you could choose from, and having a drink. . It gave you an unique and fun experience. The drinks was a bit expensive. But if you choose the £20 unlimited drinks, then it would pay off. You could take as much as you wanted of wine and beers. Its worth the money to go to Silent Disco! The whole concept being surrounded by fish and dancing around while having a drink, is a must thing to! The Silent Disco at Sea Life London Aquarium is definitely something you cannot miss if you’d like to combine dancing, singing to your lungs, and obviously if you’re a big fan of fish. Upon entrance you’re offered a complimentary glass of prosecco and a pair of headphones that will contribute to lead you towards a sublime experience you won’t easily forget. There are 3 DJs playing a wide range of music over 3 different channels (which you can easily tune into thanks to the Bluetooth headphones), ranging from rock/90’s (blue channel), reggae/house (red channel) and pop/r&b (green channel), giving everyone an opportunity to find a song they fancy listening to. During the event you’ll also have the opportunity to explore the aquarium, walk under the glass tunnel surrounded by wonderful marine creatures like sharks, giant turtles, manta rays and other fish; and at the same time also visit the brand new Jellyfish experience upstairs, in a colorful hallway that reminds a lot of 70’s psychedelia. True, it might be a pricy experience, with an entrance ticket of £29 excluding drinks, but considering the atmosphere and the quality of the music, dancing while being surrounded by fishies is not something that you’d want to miss! You’ll love it! This was one of the most magical nights out! Picture this: Entering with prosecco in hand, music all around (courtesey of headphones) through the ocean tunnel with sharks swimming above your head. In to the dark dance floor surrounded by the beautiful open ocean display lit up with mesmerising sharks, fish and turtles swimming in vibrant blue water. Then being able to take a trippy walk down the psychadelic jelly fish exhibition. All while bopping along to music across 3 channels - I honestly felt like I was floating in some weird dream world. The staff on arrival were all so friendly, bag check in was easy (£1 each though) and a wrist band for unlimited wine and beer for the whole night was available at £20. Once we had our headphones we were able to hit up the bar, dance by the fish and wander round. The music was pretty good all night, with at least 1 song I wanted to listen to (personal taste obviously!) being played throughout. I have been to the Silent Disco at The Shard before and I thought the Aquarium was SO much better exceeeeept for the music (they had some seriously cheesy channels playing Disney/Musicals etc however there wasn't much of that throughout the night at the Aquarium - good news for some I am sure). The night is a tad pricey at £30 entry each plus drinks (although a glass of fizz is included). The Aquarium itself is normally £20 entrance so it would be brilliant value if you got to see the whole/more of the aquarium (penguins, ray lagoon, rock pool etc) although logistics wise.... well ya gotta control those drunk discoing people some how I suppose! 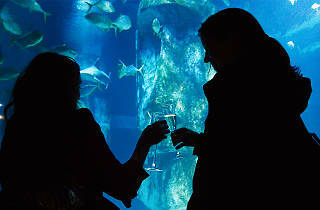 Saying that the Silent Disco at the Aquarium really is a must for a special night out regardless of the entrance fee! i love silent disco, one of the best activities to do with friends in London. Adding on a tour of the sea life aquarium, this is an event not to be missed. The aquarium is absolutely stunning, best part being the jellyfish exhibition and there is a welcome drink too. Staff at the bar were nice and friendly. The only downside is probably that there are certain areas where the reception isn't too good hence you can't hear the music but this isn't a big problem as most people end up at the main area after finishing the tour anyway. Also, cash at bar only so remember to bring cash! Well, it's of-fish-al... from start to fin-ish, the silent disco at the aquarium was brilliant! Where else in London, can you dance the night away in the company of some of the most beautiful (and some with a face only their mother could love) water welling creatures! Honestly, the excitement starts the moment you walk over a clear part of the floor where you can sea some of the aquarium's inhabitants swimming beneath you. After making your way down to the part of the aquarium where the disco is held, you aren't walking straight into random people dancing, you're in an open space where you can wander around with a drink both simultaneously taking in the view and trying to get that ultimate selfie which captures the beauty of your face and the creatures behind you. To find the silent disco, follow the muffled and half-muted singing and you'll be golden. It was a three DJ set-up; all of which had great music and that classic bantz about the other one that won't let you down. If you can think of a better way to spend a Friday night, or any night for that matter, let minnow. I can't believe it's taken me so long to get to a silent disco. This was so much fun. The setting is brilliant and you can have a (restricted) wander around the exhibitions. The fact that there is clearly a friendly rivalry between the three different djs adds a really fun element to the event but I really enjoyed the music and was constantly switching between the channels. I love that this starts at 7.30 and ends at 11.45. This is basically aimed at people who want the fun of a night out but don't want to be out until the crack of dawn. You can party hard for four hours in a top London attraction and still make the last tube home. Perfection. I wouldn't have thought of the London aquarium as a setting to host a disco but it actually worked really well. I have been to the silent disco at the shard and recently visited the aquarium to see the new ocean invaders so this was a lovely opportunity to combine the two experiences and it didn't disappoint! I mean where else are you going to get the opportunity to see two giant sea turtles getting it on while listening to Justin Bieber and sipping prosecco? It was a shame that the penguins were not available to visit as they are my favourite and also while exploring certain areas the signal cuts out so you cant hear the music but still a great experience and really good atmosphere! Ive been to a few of the silent discos and honestly I didnt think anything could top the shard but this one is a strong contender!!! Its great to shake it with the jelly fishes and bounce with the sharks ... Brings you closer to mother nature so to say! Had a blast so I'd recommend it. I had an absolutely brilliant night at the aquarium silent disco - prosecco upon arrival and so many cool things to see! The rays were my favourite, so graceful. There are a couple of huge tanks you can see from lots of different angles - rays, sharks, turtles, other fish. Plus smaller tanks and a whole section of jellyfish, with insane disco lights. And the whole time you get to wear headphones and listen to some choons! There were 3 DJs playing a wide range of music, so something for everyone. The main dancefloor was right next to the big tank so you can dance and watch fish at the same time!! Generally highly recommended. This was such an unexpectedly amazing night. We all remember going to the aquarium when we were children but the silent disco allows adults to have their fun and enjoy that nostalgic excitement from many years ago. Upon arrival you're greeted with a complimentary glass of prosecco (yes prosecco!) and given headphones. You then work your way over the glass ceiling above the sharks to enjoy this fishesta! At first I thought a silent disco might be a tad cringe but the djs were great as were the crowd and everyone really let loose and enjoyed the wave. Additionally the alcohol was reasonably priced at fourteen pounds for a bottle of wine, making it even easier to whip out all the moves as you were in your own little aquatic bubble. I thought it was great that there were three Djs who all played different genres as it gave you a real sense of control over the night as well as being able to see what was popular amongst other people. Along with the dancing you could see sharks, sea turtles, sting rays and jelly fish which made the whole experience extra special and I honestly didn't want the night to end. So if it wasn't clear from the start I highly recommend this new night that makes a change to the average bar or club and brings back happy memories of childhood, with a hint of rebellion. First of all, arriving there is a pleasure as Sea Life is located right on teh south bank with a perfectly clear view of Westminster Abbey and other striking landmarks. Included in the £30 ticket is a free glass of prosecco, which is never a bad thing. Because I had taken my monkey friend with me, I might have even got an extra one... Just some tips if you want to go with one of your soft animals tagging along. There were 3 great DJs playing very different types of music. One channel was basically cheesy pop and rock (and definitely was my favourite), one more RnB and eletro and the last one reggaetonish I suppose..? You get to shimmy around surrounded by sharks and other turtles, which is the best experience ever! Note: prepare to be there early if you want to make the most out of it as it ends a little before midnight. One and only downside: the sweat. It was particularly hot last friday when I went andit was unbearable! I suppose it makes you feel even more like some sea animal as you're pretty much as wet as a fish so if anythign it's a good thing..? Have you ever been in an aquarium, within an aquarium?? If not, run to the SEAlife London Silent Disco! In this underground atmosphere, you just put headphones on, select your music, get yourself a glass and enjoy being in your own bubble while watching amazing sea creatures! At the beginning, they seem to be the only ones understanding you, as if you were sharing the same dance floor ! But then you get caught by a crowd on fire (it's actually quite hot down there!) dancing on different musics showed by the coloured light on their headphones. Select the DJ you want to hear by tuning into one of the three channels (blue for mainstream, green for rap & rnb, red for house & techno), and see if you can colonise! If people around you tune into the same colour then you must be a good dancer. But don't forget that the winners in the end are always the sharks and the jellyfish! The Silent Disco at the Sea Life London Aquarium is extraordinary! What a experience! The Aquarium itself is already incredible beautiful! What a treat! And if you have the right crowd the dance floor will not let you down! And the fishes are happy as the loud music doesn't disturb them at all! Amazing!